As an UNESCO Creative City of Crafts and Folk Arts, Paducah is known for connecting cultures and its rich infrastructure in the arts. In anticipation of the upcoming UNESCO Cities of Crafts and Folk Arts Annual Meeting, Paducah Arts Alliance (PAA) is pleased to recognize its two most recent participants in the Paducah Artist In Residence Program–mixed media artist Sarah Ahmad from Memphis, Tennessee and sculptor Hal Stewart from Scottsdale, Arizona. Though both create dissimilar perspectives of three-dimensional art, the mixed resources of these two artists significantly enhance the value that creativity brings to Paducah. Sarah Ahmad arrived in Paducah mid-August. Her residency is the result of a creative collaboration between PAA and Yeiser Art Center. She is one of the featured artists in Liminal Identities, Yeiser’s joint exhibition on display through September 30 in the Historic Market House at 200 Broadway. Ahmad will present an artist talk with her co-exhibitor Jerry Phillips from Nashville, Tennessee, on Friday, September 22, at 4:30 pm, in conjunction with Paducah’s 2nd annual Fiber Festival. 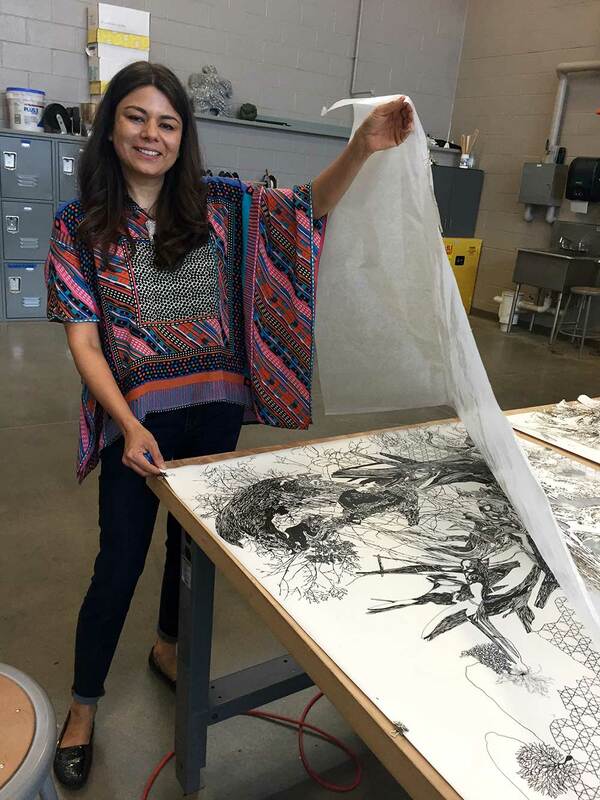 Sarah Ahmad uses a laser cutter to transform her intricate designs to paper for an upcoming installation. Ahmad’s residency provided the perfect environment and isolated time she needed to be immersed in her work. “Paducah is a charming town with a vibrant community that is so supportive of the arts and artists,” said Ahmad. “I want it to be known how appreciative I am of my time here.”Ahmad’s mixed media works and installations are created from fragments of carvings designed from geometric patterns appropriated from the art and architecture of South Asia, the region where she grew up. Her artwork has been featured in exhibitions in galleries and cultural centers throughout the United States (California, Tennessee, Texas, New York, Oregon) and in the United Arab Emirates. She was commissioned by the Regional One Hospital for a public art project in Memphis and was selected for the exhibition series Flying Solo, sponsored by the Metropolitan Nashville Airport Authority, the Tennessee Arts Commission, and the State of Tennessee. 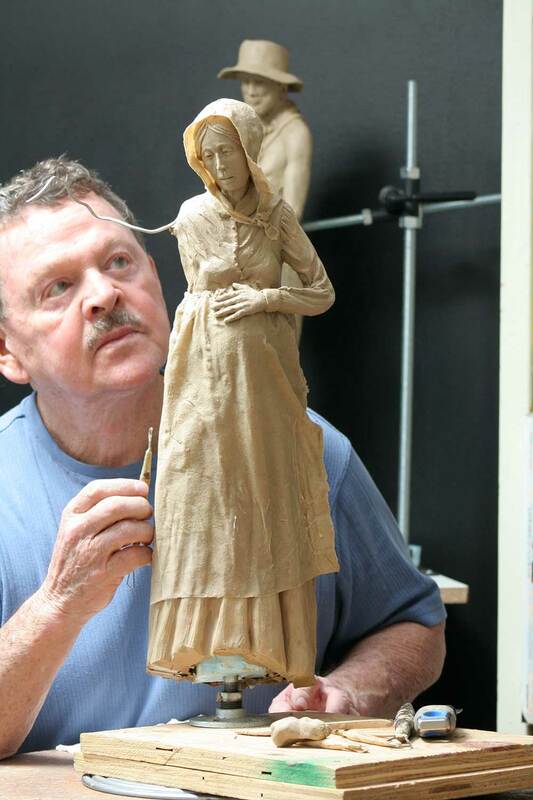 Hal Stewart began his Paducah residency on September 15 and is conducting a “Sculpting the Human Body” workshop for beginners and professional artists, Thursday through Saturday at PSAD’s 3D location on Madison and 9th Streets. Stewart will be demonstrating his artform in the rotunda of the CocaCola Building at 3121 Broadway on Monday, September 25, from 11 am to 1 pm. Hal Stewart uses metal armatures and clay to sculpt lifelike statues of the human form. Stewart grew up in nearby Marion, Illinois, where as a child he would often make small figures from the clay found in the creeks and streams, leaving them to harden in the sun. He served in the U.S. Navy and attended college before moving to a small farm and ranch in Arizona in 1968. His love of sculpting resurfaced after retiring from sales and service in the construction industry. The quick selling success of his first sculpture, Treaty Talker, led to his continuation in sculpting. Today, his subject matter ranges from cowboys and horses, to Native American Indians, birds, and animals. In his artistic career, Stewart gives generously of his time. For four years he was a volunteer art teacher to incarcerated youths at an Arizona’s juvenile detention center and has been a guest speaker at numerous art clubs and organizations. As a U.S. Navy veteran, he is currently involved in teaching disabled American Veterans. His sculptures are found in private collections, Corporate Offices, and galleries throughout the world. One of his pieces, Chasing Star Kachina, is in the permanent art collection of the U.S. Government and is displayed at the south rim of the Grand Canyon and with their traveling exhibit of Canyon artists. For more information or artist interviews, contact Rosemarie Steele (270) 331-5588 or the artists direct. Sarah Ahmad: (sarahahmad.com) ahmad.sarah@hotmail.com or (731) 697-6434; Hal Stewart: (halstewartbronze.com) stewartphx18j@cox.net or (480) 600-2722.